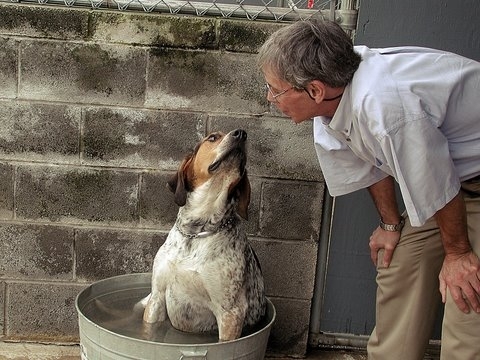 The wonderful Dr. Snyder, veterinarian to the Beagle House hounds and to the Iroquois Hunt hounds, and a longtime friend of the Hound Welfare Fund. The verdict: a muscle strain in Mr. Box’s back. O, cruel fate! To strike on Belmont Eve! Mr. Box has taken this injury in stride, but shorter, slower strides than usual. Mr. Box has limited himself to desk work today but plans to watch his namesake run this afternoon. We’re hoping that our Icebox’s equine counterpart, Belmont morning-line favorite (and Kentucky Derby runner-up) Ice Box will hit the wire first in the final leg of the Triple Crown series today. We’ll be cheering him on from our living room this afternoon when the race goes off at New York’s Belmont Park. What does our Mr. Box think of his namesake’s chances? Wow–Mr. Box sure has been studying his Daily Racing Form during his recovery! What does he think of Ice Box’s ability, pedigree-wise, to get the Belmont’s 1 1/2-mile distance? 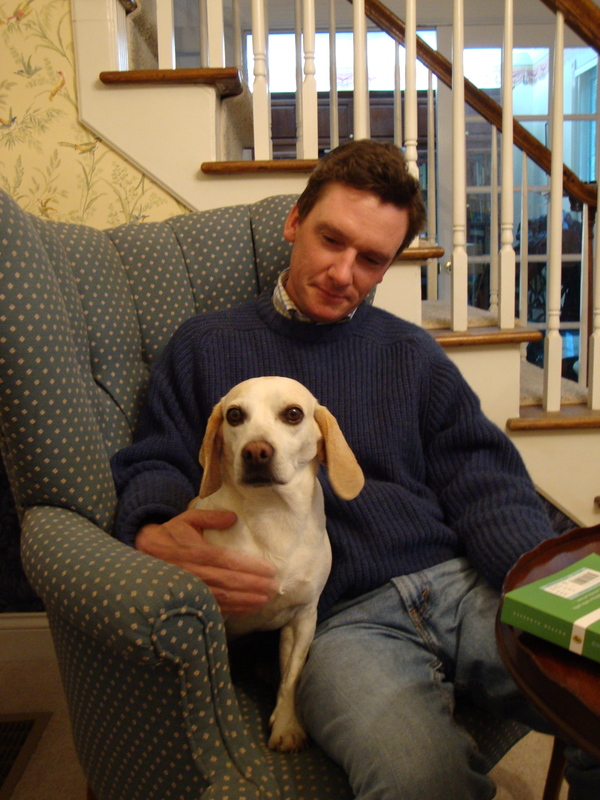 Stamina to spare: Clear Creek Beagles Icebox '04, now known as Tobermory Icebox of Beagle House. Our Mr. Box knows a thing or two about stamina, so we have no doubt he could get the Belmont distance. He’s already done more than that (but not in a little over two minutes; it took him more like two weeks). Here’s the story. It was a dark and snowy night … that’s how the tale begins. About two days after Christmas in 2004, the Clear Creek Beagles hunted farmland on Harrods Creek near Goshen, Ky. When the hunt was over and huntsman Buck Wiseman put the hounds in their trailer, Mr. Box was not among them. Buck stayed at the meet and blew and blew his horn, but Mr. Box, then known as Icebox ’04, still did not come in. Icebox was in his first season with the pack that winter, and he already had proven to be a very marginal sort of hunting beagle, even though he was by the Clear Creek pack’s legendary Moby. Icebox, it seemed, preferred going off on his own and never really got the whole gist of hunting. But this was the first time he hadn’t come in at all. Finally, Buck had to return to the kennel with the rest of the hounds. He came back to the meet by himself as night was falling and blew his horn for a long time again. Still no sign of Mr. Box. The next day, while Buck was “off being a lawyer,” as Clear Creek whipper-in Jean MacLean puts it, he deputized Jean, who was recovering from surgery but was the only other person who knew Icebox personally, to go back on the hunt for Mr. Box on the farm where the hunt had been. “I checked back for him a few more times, but there was no sign of him,” Buck continued. “The farm crew didn’t see him. No one had seen him. And then about two weeks later, I drove into the kennel, and he was sitting on the front step. 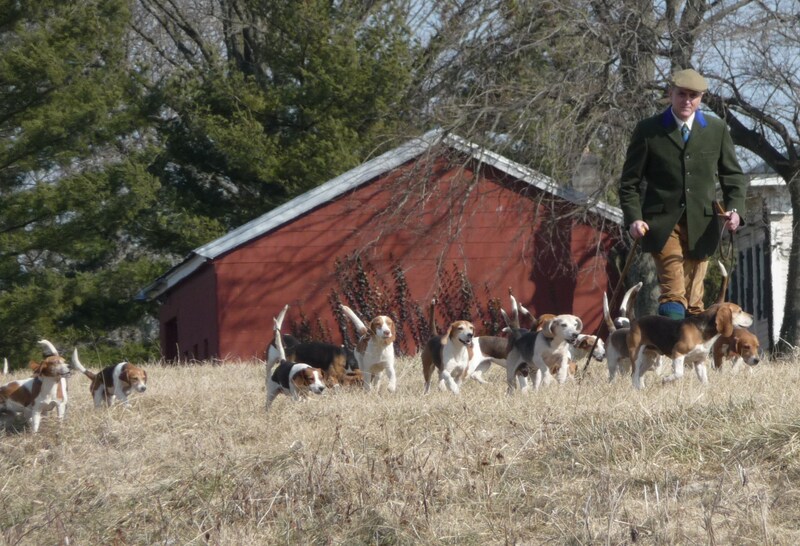 The Clear Creek Beagles pack earlier this year. Mr. Box, now retired from hunting and wandering, lives happily at Beagle House, where he enjoys his fenced yard, his companions Harry and Bingo, and sleeping next to the fire in winter. Even stranger, Icebox looked just fine. Mr. Box moved in with us four months later. He never was much of a rabbit-hunting hound, but he’s an ace at hunting biscuits. “I like biscuits,” Mr. Box concurs. And if Ice Box has any of our Mr. Box’s stamina, he’ll have no trouble handling the Belmont distance. Here’s hoping that he, like Mr. Box, comes home safely, too! Happy Belmont Day, everyone! Next time: More from the recent Virginia Hound Show trip! 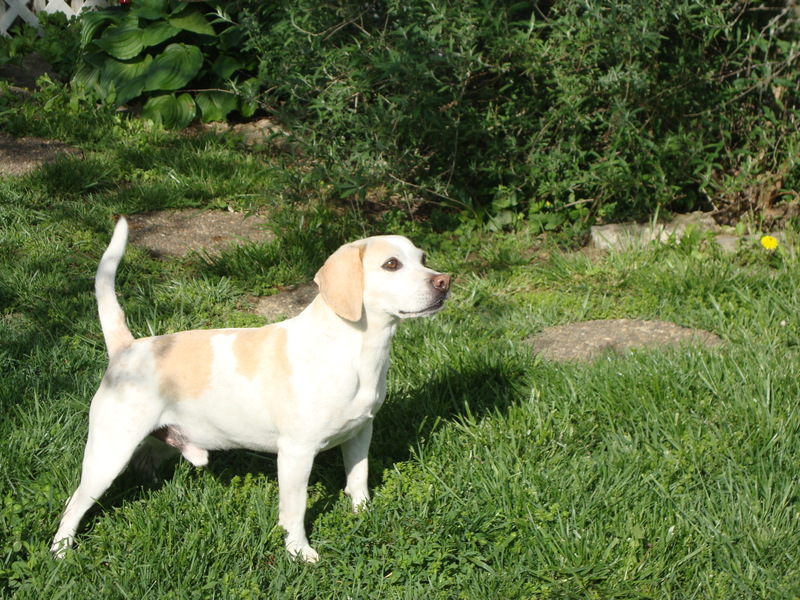 This entry was posted in Hound's Life, hounds, Hunting, In the Kennel, Retired Hounds and tagged beagle pack, beagles, Belmont Stakes, Buck Wiseman, Clear Creek Beagles, Dr. Kirk Snyder, Ice Box, Jean MacLean, Mr. 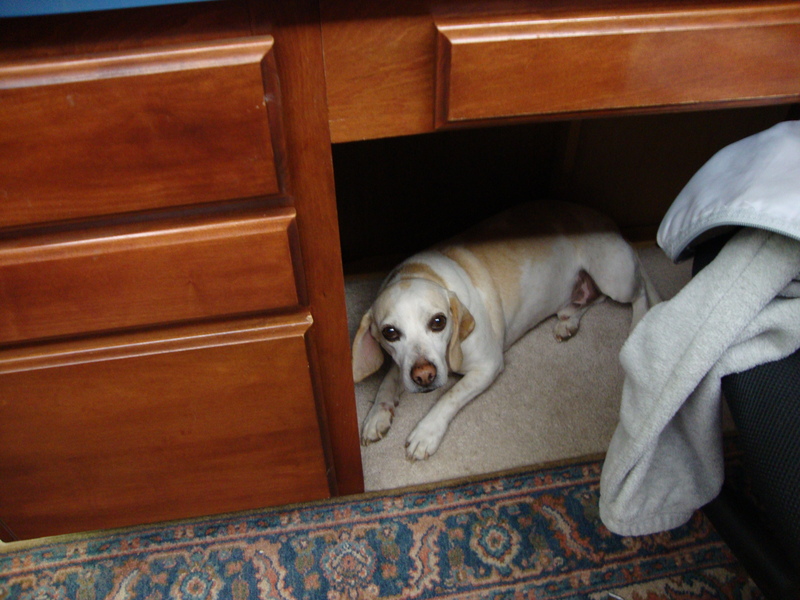 Box, pulled back muscle, Tobermory icebox, Toby, wandering by houndblogger. Bookmark the permalink.